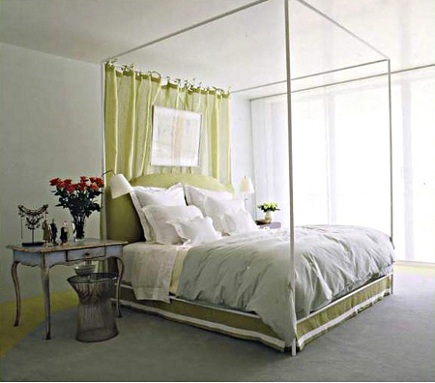 Iron frame canopy beds spring to mind when I start thinking ’ve started thinking about bedrooms. Our guest room has a platform bed left over from our daughter’s bachelor apartment but it really needs an iron frame canopy bed to look great. Canopy beds are one of my favorite styles and they come in many materials and shapes. The thing about these beds is that they look great with or without fabric panels. Designer Vicente Wolf also cleverly added an upholstered headboard to this white beauty in addition to a bed skirt draped over the mattress support so the frame color acts like a top border of the fabric. Beds of this type are fairly typical in Tuscany, where I first encountered one in the master bedroom of the house we rented in San Casciano dei Bagni for a month. 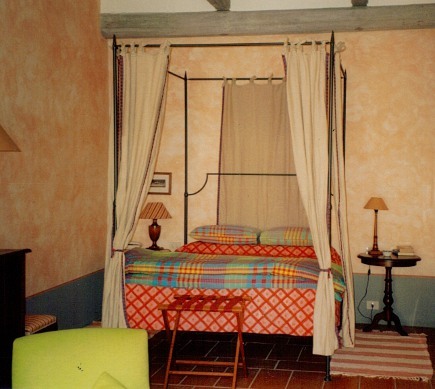 Similar locally made beds were used by my friend Daniela Boni throughout her Sette Querce hotel [above] in San Casciano, which was designed by Trisha Guild. This one has simple white canvas panels tied on, and tied back, all around. The origin of these skeletal beds is European campaign beds used during the 19th Century to furnish military tents – the sturdy frames could be broken down and reassembled as needed. In this little girls’ room by New York designer Robert Passal, the bed remains undraped but is pushed up against a padded panel fixed to the wall so the room’s fanciful colors dominate. 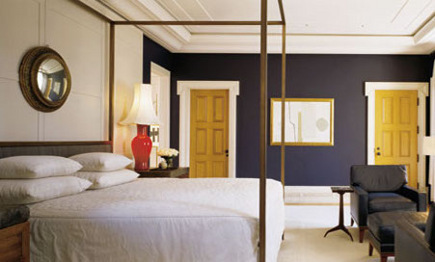 Because the lines are so slim and elegant, Thad Hayes used this bed to help push the visual height of the ceiling. The bronze tone marries well with the yellow doors and dark walls.